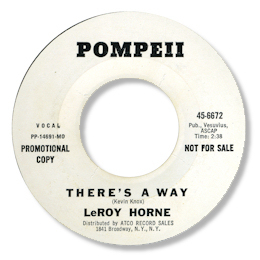 This one-off by Leroy Horne has a really strong deep side in There’s A Way. He gets more and more impassioned as the track goes on, and he builds the song into a fine climax helped by a fine band, “climbing” horns and background vocalists. The other side is a bit too frantic for me but the dancers seem to like it. I’ve only ever seen promo copies of this- was it ever issued?